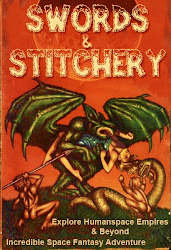 Swords & Stitchery - Old Time Sewing & Table Top Rpg Blog: OSR Hargravian Commentary - Happy International Dave Hargrave Day! 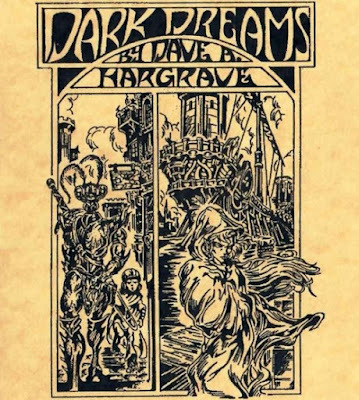 OSR Hargravian Commentary - Happy International Dave Hargrave Day! So its international Dave Hargrave appreciation day which has very different connotations for me as both a dungeon master & as the son of a Vietnam veteran. Arduin is of course the sometimes controversial cross genre fantasy world of Bloody, Bloody, Arduin. 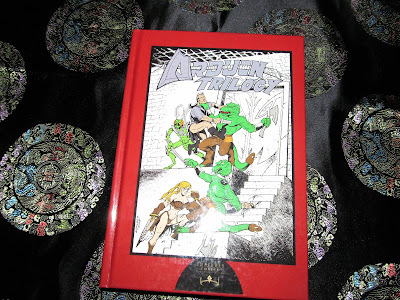 You can still get the pdf of the Arduin Trilogy here but I'd wait till it goes on sale. 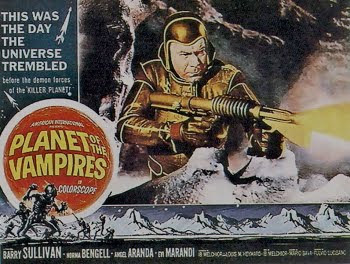 Things have been a bit well iffy from both Dragon Tree Press & Emperor's Choice for ordering items. Consider yourselves warned folks. I received those three books as gifts back in the early Nineties & they were burned up in an apartment fire ages ago. 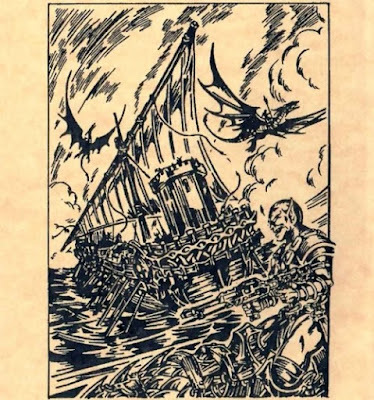 I grabbed the new Emperor's Choice Arduin reprint book the first time I got into the OSR scene. For the record I took a lot of heat for that purchase over the years from both the old school community & the local branches of the OSR. Screw 'em its been one of the best purchases of my hobby. If you want to know the contents of the Arduin Trilogy Mr.Lizard does a solid break down of the books. My uncle used the free wheeling style of the world of Arduin to weave together his own worlds & creations where we went toe to toe with all manner of horrors including renegade clans of Deodanths! 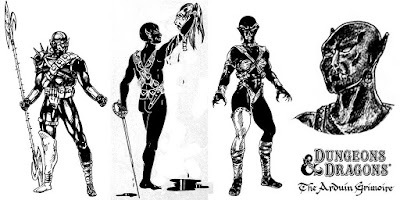 Deodanth are a cross breed of Elves & Vampires here's the concept art from the Arduin Grimore,1977 that hunt their fantasy stock brothers the Elves! If there's one constant about the world of Arduin its that power attracts power! Deodanth artwork found on twitter! 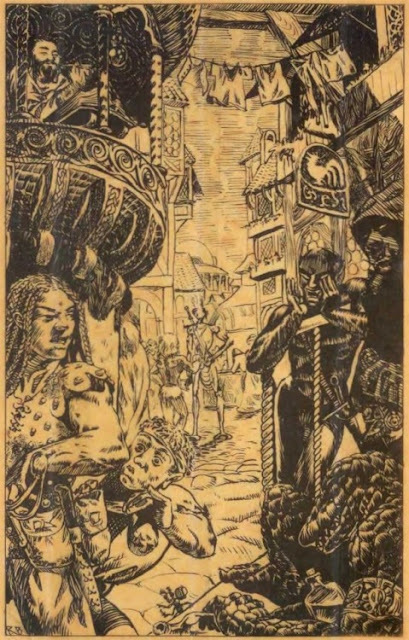 David Hartlage's blog DM David had a great piece on the Arduin books. And many games were spent battling across the face of Arduin's campaign world setting. Kill Kittens took out two of our number and then a star spider did a total party kill as we quested for the Holy Grail. Out came the Delian Book of the Dead as we'd quest for the souls of our fallen comrades but such was the heady mix of Dave Hargrave's gaming books kids! This was the U.K./California style that I was used to now a days called Gonzo or some such. To us it was pure gaming fun and that's only a part of the Hargravian legacy. Its only now that Dave Hargrave is getting his due. Today Arduin is one of those old school gaming wells that I frequently find myself returning to whist other dungeon masters & OSR bloggers seem to burn out. The sheer volume of old school weirdness & wonderfulness keeps the experience of gaming fresh for me. If you don't like something then drop it or move on! Dave Hargrave wasn't an easy character to define but he did gaming on his own terms! To quote Ryk Spoor's blog article; "The Arduin books told GMs and players that they should not believe in limits. That of course magic and technology could play in the same game – Welcome to Skull Tower gave rules for firearms, while The Runes of Doom had rules for advanced energy weapons! – that no species or type of character should be forbidden to enter the realms of adventure. Dave Hargrave painted Arduin as one of the most complex, amazing worlds ever created, with innumerable species coexisting in a world that had a massive history and mysteries hiding around every corner." For me this is the essence of Dave Hargrave's work & contribution to the old school gaming community. He was taken far too young! Had Dave Hargrave lived he would have been a major force in the OSR as his ideas & philosophy have not only come to pass but become part of the OSR mainstream. An insectoid Phraint in the big city / an Elf on the windy wharf. Dave Hargrave's imagination knew little bounds & DM's should not find themselves hemmed in by the constraints of imagination or rules. For me the world of Arduin is alive and well, sitting on my shelf waiting to be used on new & unsuspecting players & their PC's! I hope the Dream weaver & Paul Mosher who recently passed are sitting having a game right now. So shake some dice, come down to the street of Darkness, & watch out for those most dangerous Arduin horrors! Happy international Dave Hargrave day!